Soft-sided large suitcases come in a range of designs and specifications. When choosing a suitcase the ease of moving the case will be a major consideration. Modern cases come with handles and wheels so that carrying the case should not be necessary. The ease of movement of the bag will depend on the design of the wheels. Some bags can only be moved in one direction due to their rigid wheels and others have multidimensional or 360 degree wheels meaning they can move in any direction they are pulled or pushed. The material that the suitcase is made of is another consideration. Some materials are more durable than others. Most are made from a polyester type material. The weight of the overall suitcase may be a consideration if the bag is being taken on a plane. Extra zips and expandable compartments are another feature to be found in large suitcases, these are useful for adding last minute items as well as increasing the capacity of the bag. This 125 litre suitcase has expandable compartments which allow it to be compact with the option of extra capacity when needed. The material is lightweight yet strong and the suitcase comes with a 10 year warranty. 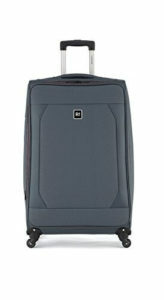 The wheels are 360 degree rotating which means that the suitcase is not limited to one direction of moving. With internal pockets to help you organise your packing, an internal packing strap helps to keep ironed items in place. A combination lock known as a TSA lock is included. TSA locks have a device which makes them openable by security but allows you to keep your suitcase secure from anyone else. A front pocket allows documents to be stored with easy access. Internal pockets and packing strap along with front pocket. Dual zips for flexible opening. This suitcase has all the features that you would want in a large soft suitcase with the assurance of a 10 year guarantee by a trusted brand. Features: Lightweight, 2.7kg. Flexible wheels, 125litre capacity, guaranteed materials. At 88 litres this suitcase by Revelation is a large suitcase with a telescopic handle and four 360 degree wheels to ensure ease of movement. It has a water resistant polyester lightweight material and the total weight of the suitcase is 3.3 kilogrammes. On the inside it has a distinctive patterned lining with a packing strap that helps to keep ironed clothes in place. It has expandable compartments so that it can be added to or with fewer items packed it remains compact. Height: 78cm, Length: 48cm, Width: 31cm, Vol. 88 litres. The revelation has all that you need for a large suitcase as far as size, ease of use and internal packing features. It is expandable which is always useful for adding to the case without having to repack. It includes a padlock and has a 5 year warranty for peace of mind. Features: Lightweight, 3.3kg. 360 degree wheels, 88litre capacity. Expandable compartment. 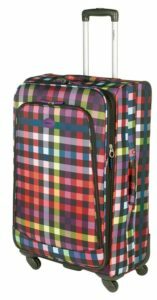 At 28 inches or 71 cm this tartan suitcase will be easy to pick off a baggage carousel in the airport. It is made of a strong material and has a sturdy construction. It has plenty of outside extra compartments to put documents in or other items needed to be at hand. It includes an expandable extra compartment to increase the capacity of the bag. It is easy to move around with its telescopic handles and multidirectional wheels. Features: Lightweight, 3.8kg. 360 degree wheels, expandable compartment, brightly coloured. All three large suitcases are of a high quality, however the Antler suitcase has the advantage of having the largest capacity which along with a 10 year guarantee would make it the first choice. The Revelation suitcase does have a 5 year guarantee however its smaller capacity would have to be taken into consideration.